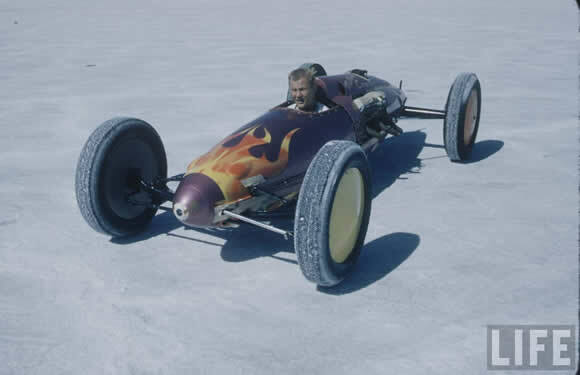 The lure of the Bonneville Salt Flats is very strong to the racers who head there every year and the cars are beautiful examples of speed and function. I hope to get there and see the spectacle myself in the next few years. Maybe even build something myself one day. That would be cool. A lot of Lakesters were made from P51 Mustang, P47 Thunderbolt and P38 Lightening long range fuel tanks and had every sort of engine and drive combination you could think of put in them. In almost no time these cars were easily achieving over 200mph in speed trials. These cars are a beautiful sight and started the legends of many engine builders and race car builders like Mickey Thompson and Chet Herbert. See some great pics from the 50's on the Selvedge Yard blog here and read about the legendary 1951 Tom Beatty Lakester here.